What Are The Differences Between A Lake And A Pond? Although separate terms are often used, there is no clear way to distinguish between the two differently-named water bodies. 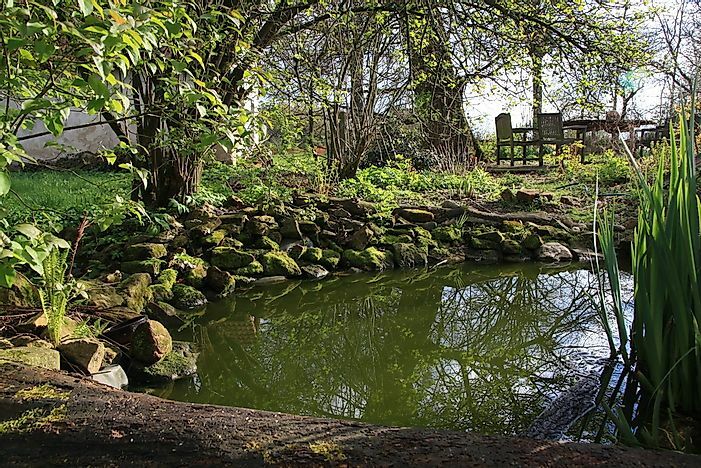 Although the perceived difference between ponds and lakes may seem obvious, the technical distinction is less clear. Lakes and ponds are both water bodies and it might be difficult to distinguish between the two from a regulatory point of view. From the naming convention there is no clear difference between lakes and ponds, and they are subject to the state water quality standards. Laws and regulations which govern water bodies make no distinction between a lake and a pond. However, both lakes and ponds are regulated through the statutes RSA 485-A and rules Env –Ws 1700. Lakes and ponds got their names from settlers who lived near them. However, these names have changed over time to attract home buyers. A lake is a natural body taking a basin form filled with water and is surrounded by land. Lakes vary in shapes and sizes. Lakes are larger and deeper than ponds, and they are distinct from lagoons and are not part of an ocean. Rivers and stream feed lakes, and most of them have outlets which enable water circulation in the lake. However, with industrialization, there are other lakes made by men for industrial and agricultural use. They are called human-made lakes. Water from artificial lakes is used for irrigation, generation of hydroelectric power, domestic use and recreational purposes. Some ponds are natural while others are humanmade. Sometimes ponds arise from floods along a river course, or they may be formed in an isolated depression. They are generally smaller compared to lakes and most ponds are constructed for many purposes like irrigation and fish farming. However, not all ponds are shallow. An example of a larger pond is Island Pond in Derry which covers 500-acre and has a depth of 80 feet below the surface. Island Pond is far much bigger compared to Echo Lake in Conway which covers 14 acres and 11 feet deep below the surface. Limnology is the study of inland waters. Water flowing continuously in a given direction is called Lotic While lentic means the water is not flowing continuously or not flowing in the same direction. Waters that fall under lentic category evolve from a lake to a pond and finally to a wetland. Lentic evolve gradually and slowly. Limnologists discovered that ponds are shallow enough for sunlight to penetrate to the bottom and can support rooted plants to grow. Lakes which are deeper than the ponds were discovered to thermally stratify into two or three layers during summer in some regions like the New Hampshire. Humanity has over the years benefitted from both lakes and ponds in different ways. Both lakes and ponds give water to people for domestic consumption. Both lakes and ponds support life. Amphibians like the frogs thrive in ponds, and plants like the algae also flourish in ponds. Many human-made ponds are used for fish farming. Lakes also support life both fauna and flora based on their thermal stratification. Some lake water does not intermix from the top to bottom which means that the bottom-most water has no oxygen, therefore, cannot support life. Such a lake is called a meromictic lake. Helomictic lakes, on the other hand, has uniform temperatures and the waters mix freely hence enough oxygen supply. What are the Differences Between Moose and Elk?